We’d love your help. Let us know what’s wrong with this preview of Nyctophobia by Christopher Fowler. An original thriller from bestselling author Christopher Fowler that reinventing the haunted house story. There are two things you need to know about haunted houses. One, there's never been an actual authenticated haunted house. Two, it's not the house that's haunted, but the person. Callie is a young architectural student who marries Mateo, a wine importer, and moves to a An original thriller from bestselling author Christopher Fowler that reinventing the haunted house story. Callie is a young architectural student who marries Mateo, a wine importer, and moves to a grand old house in Southern Spain. Hyperion House is flooded with light, it also has a mute gardener, a sinister housekeeper and a sealed, dark servants' quarters that nobody has the keys for. And although initially happy, and taking care of Mateo's daughter, Callie can't help being drawn to the dark empty rooms at the back of the house, and becomes convinced that someone is living in there. To ask other readers questions about Nyctophobia, please sign up. Can someone please explain the ending to me? It's pretty confusing.. This book was really quite incredible, the way the tension and creepiness factor slowly oozes through the words as you read on had me hook, line and sinker. Don't make the mistake of thinking because the first 20% is slow to boil that it's not a great book. There is so much stuff to come. Hold on to your hat, turn off the light, and whatever you do, don't look too closely in the corner. Newly-married architect Callie and her wealthy husband Mateo move to Hyperion House, a grand old home in southe This book was really quite incredible, the way the tension and creepiness factor slowly oozes through the words as you read on had me hook, line and sinker. Don't make the mistake of thinking because the first 20% is slow to boil that it's not a great book. There is so much stuff to come. Hold on to your hat, turn off the light, and whatever you do, don't look too closely in the corner. The house. The house. The house. Oh my goodness, THIS house will get to you dear reader as it did to me. Who thought that a building could send shivers up your spine and give you goosebumps? This house does though, and does that very, very well. Callie as a teenager was diagnosed with Nyctophobia, a fear of the dark. So when she decides to open the locked and barred doors to the locked up part of their new home she has no idea what she is walking into, or if indeed her fear of the dark will stop her from learning what is behind the doors. This part of the house is in TOTAL darkness, every window boarded up, a start comparison to the rest of the house which is designed to have constant light both day and night. Why would a whole section of house be locked up and left to ruin in thick darkness? The villagers, Spanish Catholics believe the house is cursed, it has a history going back hundreds of years. Callie is an Architect and is studying the house, learning it's history, trying to fathom out why it's built in the location it is with the aspects that is has. It's not just for fun. She really is going to wish she had not bought the house in the first place. This book slowly creeps up on you, little bits of creepy tension and scenes are dropped in to give you an appetite for more scare factor. It's not long coming, the whole second half of the book had me riveted with heart rate up and all senses on full alert! The reveals! Oh the reveals...absolutely creep-fastic brilliant, a ghost story like no other. Callie soon meets the darkness behind the locked doors whether she likes it or not. And in doing so, she as awakened those that should be left alone. With scenes to baffle you until the ending where it all makes sense, but read the ending SLOWLY dear reader, to absorb the final outcome, you won't see it coming in a million trillion years, it's very cleverly written with not so much shock factor but a stunned horror, open mouthed, gaping stunned horror. Say a prayer before bedtime if you are reading this book. Callie and her husband are opposites, and Mateo (who is Spanish, she is English) is not convinced by what Callie is telling him about the house. When his daughter, Callie's stepdaughter comes to live at the house and is being home tutored, things, happenings, and weird changes in the house really start to ramp up a notch. There is a stern, secretive housekeeper that came with the house, a housekeeper that states she "takes care of the house, not the people in it" - that should of been a sign, take note Maxine! Added to the house is an old gardener, suffering arthritis, not too easy on the nose, who is mute and unable to speak, just wait until you hear why. What do they know? Why won't they share with Callie? She's on her own in uncovering the secrets of this unusual house that has consumed her. An atmospheric and chilling book that you need to just embrace and take your time reading, it's written really well, giving you snippets of information on the way to the big reveal at the end. I have to say again, the ending is stunning, shocking, disturbing. I really liked this book, nothing like ghostly happenings to put a smile on my face (in their house, not mine) and I loved the way the book drip feeds you the creep factor until you see clearly exactly what it's really all about. This is not a horror story, there is no gore-fest here, just supernatural truths. Superstition, curses, history, revenge, death, murder, sacrifice, danger, despair..it's all here for you dear reader. Are you afraid of the dark like Callie? Best not to look in the shadows then, seriously, just don't. 4.5 stars from me. Highly recommended to those that love a ghost story especially with things you don't see coming. I am now also, petrified of hornets. There is a haunted house, or is it? There is a crazy Lady of the House, or is she? There are some weird as folk locals, or are they normal and our protagonist weird? Good, you are meant to be. That very confusion is what kept me turning page after page after page. This was my first book by Mr. Fowler, I had never heard of him before I stumbled across this wonder of a story. At only 300 pages or so this was a short read but Mr. Fowler has the gift of bringing characters, settings, and atmosphere to life in a very short time. No word was frivolous and no page was wasted. There were some genuine creepy moments but even more plentiful were the "WTF" moments. Of course the best moments were when the creepy and the "WTF" cards were played at the same time. Reminiscent of Shirley Jackson's THE HAUNTING OF HILL HOUSE in the best possible way, with a touch of John Fowles' THE MAGUS for good measure, this story of a woman fighting to keep her family and her sanity in a house of light and dark, easily earns its place in my top five favorite haunted house novels. Highly recommended. I'm painfully on the fence on this book, I really can't decide whether I loved it or hated it. Actually hate is probably too strong a word, but I am conflicted about the ending of the story. The tension builds slowly in this story (perhaps a little too slowly fo I'm painfully on the fence on this book, I really can't decide whether I loved it or hated it. Actually hate is probably too strong a word, but I am conflicted about the ending of the story. The tension builds slowly in this story (perhaps a little too slowly for my liking) but gradually throughout as Callie's insecurities and fear of the dark (the nyctophobia of the title) make her start to see things that she isn't sure are really there. As is said in the book, it's not houses that are haunted but people, and Callie is certainly haunted by her past. I wasn't 100% convinced by the author's female voice, as it's a difficult thing for a male author to get right, but I've certainly read a lot worse. As the story is written in the first person, it is sometimes difficult to work out what exactly is going on as Callie is most definitely an unreliable narrator. The author also makes good use of the Spanish setting and the ex-pat community, something he has first hand experience of. This is the creepiest book I've read in a long, long time: Callie, a young architect with a so far troubled life, moves into a huge lonely house in the Spanish countryside with her husband Mateo and her stepdaughter Bonnie. The house is built so that the front lie always in the light and the back rooms, which are locked, lie always in the dark. With the family are living a housekeeper and a mute gardener. Mateo has to do a lot of travelling and thus Callie is often left alone with the other thre This is the creepiest book I've read in a long, long time: Callie, a young architect with a so far troubled life, moves into a huge lonely house in the Spanish countryside with her husband Mateo and her stepdaughter Bonnie. The house is built so that the front lie always in the light and the back rooms, which are locked, lie always in the dark. With the family are living a housekeeper and a mute gardener. Mateo has to do a lot of travelling and thus Callie is often left alone with the other three. Callie is suffering from nyctophobia, fear of the dark, and is scared of the dark part of the house. When trying to find out about this dark side she meets many obstacles and is drawn ever deeper into the houses' dark secrets. I like good creepy ghost stories which cause the horrors by ones deepiest fears and not so much by slaughtering others. Nyctophobia is a very scary book which makes you fear the dark and makes you question what's really behind those shadows. If you're fans of the more subtle horror this book might be just the thing for you. Fowler spins the haunted house tale into something unexpected....a fresh take on a classic archetype, balancing modern style with pitch perfect "old school" pacing that raises the creep factor exponentially. This book was slow, but entertaining. Confusing, but engaging. If I had to put this book in the same category of another book, I'd say this is sort of like "I'm thinking of Ending Things". It's got the same kind of vibe. A slow story that starts to reveal itself piece by piece. The ending may be predictable to some, (broken record...story of my life), but I didn't seem to see what was going to happen until it did and was left feeling sort of empty. The ending is ambiguous. I don't know how I fee This book was slow, but entertaining. Confusing, but engaging. If I had to put this book in the same category of another book, I'd say this is sort of like "I'm thinking of Ending Things". It's got the same kind of vibe. A slow story that starts to reveal itself piece by piece. The ending may be predictable to some, (broken record...story of my life), but I didn't seem to see what was going to happen until it did and was left feeling sort of empty. The ending is ambiguous. I don't know how I feel about those kinds of endings. Am I happy that I get to create my own ending? Not sure. Overall it was good. 3.5 stars! Nyctophobia- is a severe fear of the dark. I didn't know that was a real phobia. I thought of course kids can be afraid of the dark, but so can adults. The real phobia is debilitating. Callie has a pretty terrible past. She has tried to move on as an adult, but it's slow going. Her mother hasn't helped much in that department. Continuing to belittle her and say her past was an exaggeration, never quite believing her daughters hardships. Anne, Callie's mother is only interested in keeping Callie quiet and hidden so not to embarrass her. One night at one of Anne's get together's with friends (Callie doesn't want to be there), Callie meets Mateo. Mateo is a Spanish business man who works in wine. They get to talking and the rest is history. After Callie and Mateo marry they move to Gaucia a small town near Marbella, Spain. They are house hunting. Callie comes across the Hyperion House and falls in love with its mystery and light. Callie is into architecture and knows how strange this house is. She is able to convince her new husband that this is a house she must have. What Callie didn't expect is all the house had to offer. Good or bad. Callie's old phobia starts to come back and she slowly starts to crack. Following Callie's journey in researching the old residents of the house and the family that built the house was engaging. At times I felt the story did drag a bit and it seemed Callie was weak willed. As the owner of the house she should be able to make decisions without her husband, but this is a different country and traditionally the men are in charge. Callie has a hard time excepting that coming from the U.K. I felt that we could have had more connection with Mateo. We hardly got to read about him, he's always away on business. He does explain to Callie that it will happen and he hopes he can arrange for my time closer to home in good time. This will give Callie a chance to get to know her step-daughter Bobbie a bit better. Who marries and leaves their children to a new adult like that? It seemed so rushed. I know these things happen in life and I just don't have that experience so it wasn't a deal breaker. The reason for the 3.5 star rating is the pacing was a bit slow. Mateo wasn't a full fledged character. The lies drove me crazy. I think that could have been done a little differently. Tell some, but not all. I am really torn in two with this read! In fact I first drafted a review a day after I read it, but now, several days later, the final thing that had been bugging me about it suddenly clarified itself in a “lightbulb moment”. There are parts that I really loved but others just left me rather confused at first. Callie and husband Mateo have bought their dream home in Spain and are moving in and life should be perfect, with the two of them still in their honeymoon period. Callie even gets on well w I am really torn in two with this read! In fact I first drafted a review a day after I read it, but now, several days later, the final thing that had been bugging me about it suddenly clarified itself in a “lightbulb moment”. There are parts that I really loved but others just left me rather confused at first. Callie and husband Mateo have bought their dream home in Spain and are moving in and life should be perfect, with the two of them still in their honeymoon period. Callie even gets on well with her 9 year old stepdaughter Bobbie, but pretty soon strange things start to happen in the house. Part of the house is locked off and keys are rare on the ground but Callie becomes convinced that someone is in that hidden other part of the house. I loved the characters in the book, even their very pink estate agent and her rude “you might want to get rid of all this rubbish …” comments. Their housekeeper Rosita is very creepy, almost a Mrs Danvers in a mantilla and lurking in the background is Jarardo, a very strange and mute gardener. They, like their families before for them, have worked at the house all their lives. Rosita makes it clear in the book that she is the Housekeeper, who looks after the house, and the house looks after its own. A point well worth remembering later on in the book. I didn’t quite get what attracted Callie and Mateo to each other – they seemed total opposites with nothing in common – certainly not an obvious coupling. Whilst I could understand Callie wanting security and a nice life – what was the attraction of Callie for Mateo? The story builds very slowly, and at times you could be forgiven for forgetting the genre of book you are reading and maybe I would have liked the spookiness to start a little earlier than it did. When it does start though, things soon get very creepy indeed in a very understated way. Nothing in your face, just quiet “scared of the dark” bumping in the night terror. However, I did wonder a few times about some of the actions Callie takes, the decisions she makes and her reactions to things. They didn’t seem normal but almost certainly down to the seductiveness of the house. It did get very spooky indeed right up until the big reveal which was a bit, well, weird and I couldn’t quite grasp some parts of it without re-reading the last couple of chapters until I “got it” and then had that “lightbulb moment” that I already mentioned. Having said that, it is not a bad read at all, chilling and one which leaves you wanting to go back over the book to get everything straight in your mind. Nyctophobia is an almost perfect exemplar of mediocrity. It's definitely not bad -- the plotting is decent; the writing is clear -- but it is not good either. More or less a haunted house novel, Nyctophobia starts out strong, at least by the standards of the haunted house horror sub-genre, by putting our haunted house in Spain and making it a modern dwelling full of light. If ever there seemed to be a less haunted house in terms of architectural design, I don't know what it is. We even get a Nyctophobia is an almost perfect exemplar of mediocrity. It's definitely not bad -- the plotting is decent; the writing is clear -- but it is not good either. More or less a haunted house novel, Nyctophobia starts out strong, at least by the standards of the haunted house horror sub-genre, by putting our haunted house in Spain and making it a modern dwelling full of light. If ever there seemed to be a less haunted house in terms of architectural design, I don't know what it is. We even get an English ex-pat as our main character which is cute given how the English flock to Spain for the Majorican bacchanalia tourist traps and for inexpensive retirement homes. This is definitely intentional on Fowler's part and I appreciate the joke. But then everything goes the way of an average book: our main character has some interesting flaws -- childhood nyctophobia (fear of the dark) as one -- but how this really affected her, beyond making her sleep with a nightlight, is never fully flushed out. Similarly, our heroine has a checkered past that is alluded to, and apparently is super important to why she reacts as she does to her husband, step-daughter, new house, and Spain in general, yet is presented in no more than a paragraph (excluding redundancy) and tritely at that. We get no real sense of whatever her name was (my failure of memory here is in itself is telling) as a real person who has been hurt by her childhood and suffered real consequences of questionable behavior in her young adulthood. What we get is a cardboard cut-out. Of the motivations of Nyctophobia's other characters, we get no sense of this at all. However, this doesn't mean that this makes the novel bad per se, just unremarkable. We can give Fowler some credit in that he at least tries to shake-up the haunted house sub-genre with a non-standard haunting and a mystery, but when the big reveal happens, it isn't shocking or particularly interesting -- no The Others or The Sixth Sense surprise here -- and after having our character run around testing out 20 different scenarios to figure out what was going on, the actual explanation, while very cool in theory, is sort of blah. It doesn't help that it is a theory which was never really considered by our heroine, so the twist seems a bit cheap. As my final criticism, which I suppose regards what I believe Fowler was trying to do in order to elevate his story into literary horror or just not descend into The Amityville Horror , is that the ending is just perplexing. I can't go into details here lest I ruin it for everyone, but the actions of our narrator are just weird. Of course, we never did get a real sense of her motivations, so maybe the ending makes perfect sense in Fowler's mind, but not to this this reader. My overall recommendation to possible readers out there is that if you get this book for free, and have some time on your hands, it is probably worth a read. However, under all other circumstances, go spend your hard-earned money and hard-won time on something else: The Elementals , The Haunting of Hill House or The Shining , to name but three entries into this sub-genre, immediately come to mind. Of course, if you are like me, you already read all those -- and hundreds of others besides -- so despite any review, you aren't going to pass up any story that involves a haunting/haunted house. In which case Nyctophobia won't frustrate you, but you probably won't be singing its praises from the rooftops either. I can't decide if I want to give this two or three stars, but I am giving it two because I genuinely disliked almost every character presented to me. Callie is the most clueless and naive excuse for a protagonist I have ever met. She seems to make decisions based on absolutely nothing, with no regard for the consequences. She seems to know nothing about the man she married, and throws herself into whatever whim next crosses her mind. Her character read like a teenage girl. Which, is not necessar I can't decide if I want to give this two or three stars, but I am giving it two because I genuinely disliked almost every character presented to me. Callie is the most clueless and naive excuse for a protagonist I have ever met. She seems to make decisions based on absolutely nothing, with no regard for the consequences. She seems to know nothing about the man she married, and throws herself into whatever whim next crosses her mind. Her character read like a teenage girl. Which, is not necessarily a bad thing at all, she just read like she lacked the brain development to make solid, adult choices. This story is partly about things done to escape a phobia of darkness and something, a house built for a beloved to protect her from that fear. Callie and her husband but this beautiful home that is both stunningly filled with light and, at the back, dark. It functions like a camera obscura, but Callie can't help but meddle with the dark miniature rooms and defy the housekeeper who came with the house. She chases things in the dark. But what is there? What is real? The ending is very puzzling an This story is partly about things done to escape a phobia of darkness and something, a house built for a beloved to protect her from that fear. Callie and her husband but this beautiful home that is both stunningly filled with light and, at the back, dark. It functions like a camera obscura, but Callie can't help but meddle with the dark miniature rooms and defy the housekeeper who came with the house. She chases things in the dark. But what is there? What is real? The ending is very puzzling and like another reader said.... take it slow. I'm still kind of puzzling over different options. 3.5 stars. I liked this book but there were some things mentioned I would have liked to known more about. I chose to review this as an ARC because I am such an admirer of Christopher Fowler (so far, specifically ROOFWORLD and RUNE), but at first (perhaps because the core of the story occurs in Spain), I didn't cotton to it as I'd expected. I thought I was reading a cross of Daphne du Maurier with Sarah Rayne. As I persevered, the tale grew on me. Eventually I realized that I held a story truly terrifying (I expect it will come alive in my dreams). If you're expecting splash and Gore, dripping walls, and rattling chains, keep moving. But if you appreciate the literary tradition that flowered in du Maurier and Rayne, and Charlotte Perkins Gilman: well, here's a house I'd like you to visit--Hyperion House in Spain, the "House of Light" where sunlight graces every single room from sunrise to.sunset....excepting only that set of always darkened, unwindowed rooms built into the mountain which the house abuts. I reviewed an ARC provided by the publisher via NetGalley for the sole purpose of my fair and honest review. No fees were exchanged. I was so excited about the first half of this book, a delightfully spooky story about a house haunted by....sunlight? It was both creepy and interesting, but the cracks started to show about halfway through as the strain of creating a believable relationship from an unlikely pairing (although I want a Mateo for myself!) and some of the stupid acts of the heroine diminished its effectiveness a bit. The end redeemed the book a bit (no spoilers here) and overall it was a page turner ARC for review. Nyctophobia is slow to start but, it builds to a much faster pace. There are some genuine scares in here and the ending is good and creepy. Not what I expected and that was a good thing. Nyctophobia - defined as the "extreme or irrational fear of the night or of darkness"
Nyctophobia is a haunted house/ghost story. It's about a newly married family that moves into Hyperion House, a new house they just bought in Southern Spain. "There are two things you need to know about haunted houses. One, there's never been an actual authenticated haunted house. Two, it's not the house that's haunted, but the person." The first three quarters of this book was fantastic! Fowler really nails the creepy, gothic atmosphere, the secluded old house on a cliff and the quirky and sinister characters. Now if you are the type that doesn't mind an ambiguous ending, then I would definitely recommend this book for you because other then that, it really was a fantastic haunted house story. This book has a number of things that I enjoy, mainly an unreliable narrator and an ambiguous ending. I like psychological stories that make you question if all of the events of the novel actually happened, or if they are just the imaginings of a deranged mind. "Nyctophobia" leaves the reader with a lot of questions and no clear answers, so if you are put off by that type of story this one is probably not for you. I enjoyed this novel, but there really isn't anything new here in regards to haunte This book has a number of things that I enjoy, mainly an unreliable narrator and an ambiguous ending. I like psychological stories that make you question if all of the events of the novel actually happened, or if they are just the imaginings of a deranged mind. "Nyctophobia" leaves the reader with a lot of questions and no clear answers, so if you are put off by that type of story this one is probably not for you. Clever, very clever this little story will keep you thinking the whole time. You may work it out at the end or it will take a few hours and WHAM! Now the plot cannot be discussed as a wrong word could spoil a third of the book. The ending is superb with a good chance that you dear reader, like me, could add the paragraph at rhe end that does not need to be written to understand. A five star thumbs up for this. Oh best 10 page opening sequence ever before the book starts. Love the flickering light b Clever, very clever this little story will keep you thinking the whole time. You may work it out at the end or it will take a few hours and WHAM! Now the plot cannot be discussed as a wrong word could spoil a third of the book. This book was the worst kind of disappointment for me. The story was very cool and held so much promise but the author seems utterly unable to deliver that promise. The book reads completely unedited. Typos and grammar mistakes abound and so many words used completely inappropriately I lost count. The dialogue was abysmal. I physically cringed. I very nearly did not finish and upon finishing I immediately regretted wasting my time. Such a disappointment. Honestly I want to say 2.5 - 3.5 stars. I saw another reviewer state they had a love/hate thing going with this book. Same for me. I was so drawn in at first. Loved the whole feel of the book. It kept me wanting more. But then maybe half way thru, I just started to not care at all & almost decided to ditch the book altogether. But, since I already was somewhat committed (barely but just enough), i decided to see where it went. For me, not far. Didn't really get the ending but then again, not Honestly I want to say 2.5 - 3.5 stars. Depending on your point of view, I suppose I am either the perfect or the worst ever candidate to read this book. Ever since I can remember I’ve always had “issues” with the dark. To give you some context, I have been known to walk/talk and, on one memorable occasion, scream while asleep. I also regularly wake in the pitch black utterly convinced that there is some else in the room. Sometimes these night terrors are so vivid I am unable to even open my eyes, I am literally paralysed by fear. The Depending on your point of view, I suppose I am either the perfect or the worst ever candidate to read this book. Ever since I can remember I’ve always had “issues” with the dark. To give you some context, I have been known to walk/talk and, on one memorable occasion, scream while asleep. I also regularly wake in the pitch black utterly convinced that there is some else in the room. Sometimes these night terrors are so vivid I am unable to even open my eyes, I am literally paralysed by fear. The one thing that also stays with me after these events is that sense of complete and utter powerlessness. Fowler’s latest is scattered with so many moments that recapture that feeling it makes me shiver just thinking about it now. When we first meet the novel’s main protagonist, Callie Shaw, she has just taken a huge leap of faith. She has given up her old life, thrown caution to the wind, and started a brand new chapter. Moving to a new country should be the happy ending that she had always dreamed of. She has managed to escaped the rat race of London, found the love of her life and left the traumatic events of her past far behind. Everything for Callie should be perfect, so why can she not shake the feeling that something is terribly wrong. Nyctophobia is described in the dictionary as being an extreme or irrational fear of the night or of darkness. Callie has lived with the condition for years and it is always seems to be present. That primal fear of the unknown, of what lies within the inky blackness. is ready to chip away at her self-confidence at a moment’s notice. There is a deliciously sinister undercurrent that permeates every chapter. Initially Hyperion House appears to be quite the rural idyll, but the longer Callie and her new family stay there, the more unsettling things become. As Callie begins to uncover the history of the structure, and the families that have lived there before, she starts to realise that everything is far from normal. Fowler excels when it comes to setting the scene, even the smallest of details are important. The relationships between Callie, Mateo and his daughter Bobbie, the eerie stillness of the remote locale, the pervasive heat of the Spanish summer, even the unique architecture of the building, all help to play tricks on Callie’s already fragile mind. It’s a masterclass in horror watching her descend into madness. Callie has to dig deep in order to try and overcome her fears. She has to motivate herself to act, to take charge of her own life. The terrors in Nyctophobia are as much internal as external. I’m not normally a fan of a slower paced narrative, but this is the exception to the rule. This novel relies on that slower build up to crank the tension to fever pitch, while also managing to lull the reader into a false sense of security. Just at that point when you think you can’t take any more, when you’re sure you’ve got things figured out, that’s when Fowler really starts messing with your head. I love horror like this, it’s that slow twist of the knife, that sense that something horrific is happening just outside your field of vision, the feeling of impending doom. Each new sentence, paragraph and page are used to establish an every growing sense of dread. I’ve been a fan of Christopher Fowler’s writing for years, and he never fails to disappoint. Nyctophobia is another fine example of his work. This is a creepy, atmospheric tale that blends the psychological and the supernatural effortlessly. If you’re in the mood for a ghost story that is going to make the hairs on the back of your neck stand on end, then look no further. Nyctophobia is the best horror book I’ve read in 2014, and I doubt I’ll find a better book any time soon. The writing was exquisite, rich in detail, atmospheric and haunting. The book started out slow, and I expected to find a rather standard haunted house story, but this is completely different, and utterly, utterfly terrifying. I had nightmares about this book last night, and I don’t think they’ll be the first. I don’t mind nightmares though, especially not when the cause is a book as amazing as this one. In Nyctophobia, Callie has had a troubling childhood. Anorexia, trying to commit suicide, a controlling mother…When she meets Mateo, it feels like she’s finally getting her life back together. He’s a wine importer, originally from Spain, and years older than her. But to Callie it doesn’t matter – she’s in love, and Mateo is the best thing that ever happened to her. The two of them get married, and Mateo buys a grand old house in Southern Spain, named Hyperion House. The house is strange, and an architectural miracle, which is great for Callie. She studied architecture, and wants to write a book about the house. The front part of the house is always bathing in light, and ideal place for a person with nyctophobia – fear for the dark. But the back part of the house, the servant’s quarter, are always in the dark, with a mountain looming over them. As Callie and her family move into the house, she wants to investigate all the rooms, including the ones in the dark. However, the rooms are locked, the keys supposedly lost. The old housekeeper won’t share any secrets about the house, even though Callie feels she’s keeping quite a few. But then Callie starts hearing strange noises from the darkened rooms, shuffling, footsteps, furniture moving, whispers. What is going on in her new house? How is it connected to the previous owners? Can she protect the people she loves? I know it may sound cliché, but one it’s revealed what’s going on…well, I was shocked enough to nearly drop out of my chair, and then I was so terrified I had to glance behind my shoulder every now and then. There is no blood and gore, but the horror slowly creeps up on you, until it soaks into your skin and doesn’t let you go. Amazing. Horrific. Terrifying. The best writing I’ve read in ages. Read it for yourself if you don’t believe me, but I can do nothing but recommend it. I do have to say this was an extremely unusual take on the haunted house sub-genre of horror, and I could see it being made into one seriously creepy Hitchcock-ian horror story. This is especially true when considering the events near the end. The author does a great job with imagery that paints a vivid image in your mind’s eye. However, the actual end was a bit off. It was an ambiguous ending that made it seem like the author was trying a bit too hard to throw one last curve ball at you. I don’t believe he was. I believe that he had it planned from the beginning. However, the writing needs to have been tightened up a bit to pull it off more effectively than what he managed. Even though my overall impression of this book wasn’t particularly high, I will say Nyctophobia is one of those books that needs to be read twice. It’s the type of book that has one of those revelations near the end that cause you to want to go back through and see if there were other clues that you missed. While it never truly engaged me, it more than mildly entertained me, and I can see people who like their horror a bit more Twilight Zone than I do definitely enjoying Fowler’s work. It has this laid back air of creepiness and mystery that should be savored like a fine wine. I just happen to hate wine. I know Christopher Fowler mainly from some of his incredible short stories that appear quite regularly in Best New Horror. (If you haven't done so already, please track down Norman Wisdom and the Angel of Death). An autographed copy of his latest book (bought at London's Forbidden Planet) seemed too good to pass up even if the blurb implied a rather done to death narrative. And sure enough, if you are a longtime horror fan, they are cliches aplenty: the disturbed narrator with a tragic, violent p I know Christopher Fowler mainly from some of his incredible short stories that appear quite regularly in Best New Horror. (If you haven't done so already, please track down Norman Wisdom and the Angel of Death). An autographed copy of his latest book (bought at London's Forbidden Planet) seemed too good to pass up even if the blurb implied a rather done to death narrative. And sure enough, if you are a longtime horror fan, they are cliches aplenty: the disturbed narrator with a tragic, violent past and a history of well...nyctophobia, a house that seems too good to be true and a tight-lipped housekeeper who obviously knows a lot more than she claims to know. However Fowler is too skilled a writer to spin a wholly cliched narrative. Our narrator moves into a house which basks in a near permanent light while the other half of the house is locked and apparently shrouded in darkness. Through the course of nyctophobia, Fowler manages to suffuse both the bright and the dark halves of the house with a brooding menace; the result of a bunch of incremental details, which give the veteran horror reader a great idea of what's coming up next while still managing to hold on to a bit of surprise for the reveal. I haven't Nyctophobia is a fear of the dark (or darkness) and is the perfect title for a novel, don't you think? 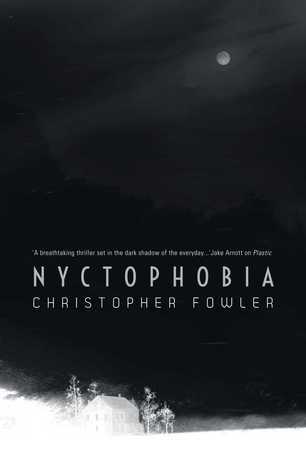 Paired with an appropriately dark and spooky cover, Nyctophobia by Christopher Fowler ticks the box in a number of genres, including: science fiction, urban fantasy, supernatural and mystery of the highest order. He quedado muy sorprendida con este libro. Tiene un inicio lento donde la trama se va desenvolviendo poco a poco. La protagonista sufre de nictofobia, miedo a la oscuridad, por lo que cuando comienzan a suceder hechos extraños en su nueva y misteriosa casa, comencé a dudar de si todo era imaginación de ella o realmente había algo raro con este lugar. Me encantó como el autor logró transmitir las dudas y miedos de la protagonista al lector, hubo escenas donde sentí el miedo de Callie. El último tercio del libro tiene muy buen ritmo y el final es magistral, lo adoré. Muy buen libro para comenzar el mes de Halloween. This ended up being quite a difficult read for me as I found it very slow paced, there was so much build up to pretty much nothing in my opinion. I found each character quite annoying and fairly dim to be honest as who really buys a property without seeing half of it? Not a lot of the storyline made a lot of sense and there were quite a few errors in the writing which was pretty distracting. It wasn't all bad as there were a couple of chilling scenes but unfortunately they were very short lived, I wanted more scenes like that. The idea for the story is indeed very original but in my opinion isn't very well executed.